The earth is facing an environmental Armageddon for which the only answer is … a global government. For many people around the world (not just the United Nations), the global warming issue and the potential global regulation of emissions, provides a means of achieving their desired goal: global governance. This is the reason that the “debate is over”. In science, the debate is not over. In politics… well… “A comment about the scientific community. It is easier sometimes to get consensus in the political community, rather than in the scientific community.” quote by Maurice Strong, July 2009 (Strong was a key developer of the global warming scare – see below, and see the History of the Global Warming Scare). The concept of global governance was promoted in 1991 by the Club of Rome in a report called “The First Global Revolution”, which asserted that current problems "are essentially global and cannot be solved through individual country initiatives [which] gives a greatly enhanced importance to the United Nations and other international systems." Also in 1991 Strong claimed that the Earth Summit, of which he was Secretary General, would play an important role in "reforming and strengthening the United Nations as the centerpiece of the emerging system of democratic global governance." In 1995, in ‘Our Global Neighborhood’, the CGG [UN Commission on Global Governance] agreed: "It is our firm conclusion that the United Nations must continue to play a central role in global governance." the Commission's recommendations: for instance, that some UN activities be funded through taxes on foreign-exchange transactions and multinational corporations. ... It also recommended that "user fees" might be imposed on companies operating in the "global commons." including carbon taxes, which would be levied on all fuels made from coal, oil, and natural gas." [http://www.afn.org/~govern/strong.html]. von Weizsecker, E., A.B. Lovins, and L.H. Lovins, 1998: Factor Four: Doubling Wealth, Halving Resource Use. Report to the Club of Rome. Earthscan, London, United Kingdom, 322 pp. “The world has cancer and the cancer is man.” – quote from A. Gregg as the opening to Chapter 1 of the “Second Report to the Club of Rome – Mankind at the Turning Point”, 1974. “I hope [the Club of Rome] will continue for many years to come to spell out the unpalatable facts and to unsettle the conscience of the smug and apathetic.” – Prince Philip in his message to the Delegates, 20th Anniversary Conference of the Club of Rome (in “The First Global Revolution”). Prince Phillip has also made the statement: “In the event that I am reincarnated, I would like to return as a deadly virus, in order to contribute something to solve overpopulation.” in the foreword to Fleur Cowles’ “If I Were an Animal” 1987. [http://en.wikiquote.org/wiki/Prince_Philip,_Duke_of_Edinburgh] Prince Phillip served as the president of the World Wildlife Fund International from 1981 – 1996. The WWF provides fund-raising for the IUCN. The Washington State based “Yes” magazine is a big promoter of the global warming scare among “progressives”. It is published by David Korten of the “People-Centered Development Forum”. 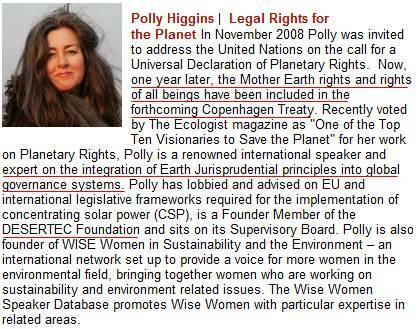 Korten is a full member of the Club of Rome – one of only four in the USA. (The list of current members is available at [http://www.clubofrome.org/eng/people/full_members2.asp].) Korten recently published a book called “Agenda for a New Economy” which he launched at the Trinity Wall Street Church. He states: “My presentation … made the case that the Wall Street financial crisis is at its core a spiritual crisis born of a violation of the biblical injunction against the worship of Mammon”. In the book launch, he referred to a Democracy Now interview with his wife, which featured “her relationship with Ann Soetoro, Barack Obama’s mother, when we lived in Indonesia”. [http://www.davidkorten.org/NewAgendaLaunch]. 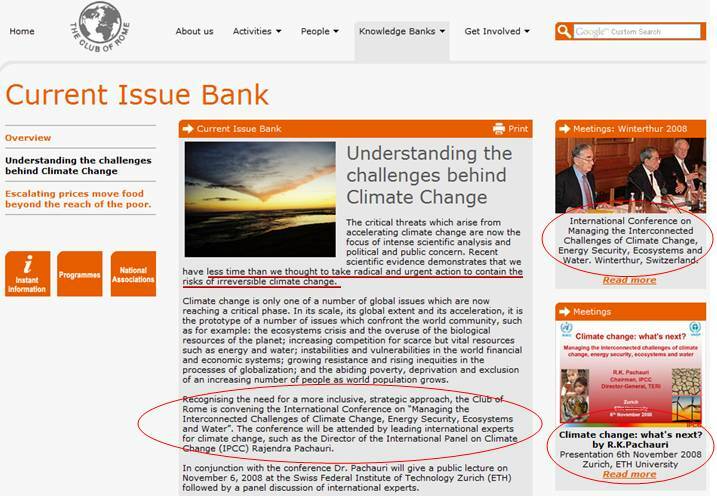 See http://www.appinsys.com/GlobalWarming/CarbonMonetization.htm for information on the “benefits” of carbon trading and the connections between those benefiting and the UN.